In the summer of 1962, Norman Griffin, then chairman of Reading YHA Group, received a frantic phone call from Ken Walker warden of Streatley Youth Hostel. Another YHA group had advertised and received several bookings for a long distance walk between Marlborough and Streatley but, at the last minute, found they were unable to cope and had withdrawn their organisation altogether. It was natural for the warden to turn for help to Reading Group as it had close ties with the hostel; the group often had working parties at the hostel and it held regular meetings there. The group decided to postpone the walk to the 30th September. But this date clashed with an event run by another London Region group. 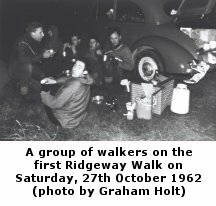 And so, at a group meeting at Streatley on 1st August 1962 it was decided to hold the Ridgeway Marathon on Saturday, 27th October. It is arguable that Reading Group was overreaching itself. Some group members would have liked to have done the walk themselves but, with only about 20 active members (at the best of times) everyone was needed to marshal the walk. As it was, the number of members who turned out to marshal was 18, one more than the number of walkers. The initial walk was not without its problems. One marshal walking out from Streatley underestimated the speed of the walkers with the result that he was overtaken by many of them before he reached his checkpoint. The soup urn (loaned by the Regent Cafe where the mother of group members Ian and Robin Davis worked - and filled with soup made by Ken Walker) was left on the side of the road some way from where the marshals were camped and stood there forlornly as walkers passed by it. To placate the walkers, marshals further along the route had to hand out their own personal food supplies as an act of appeasement. And two walkers from Marlborough did half the walk without the benefit of route instructions. Drew Parsons, one of the two entrants from Dartford YHA Group, recalls that the 1962 event was a lovely remote walk on a cold day and that they passed wonderful round barrows and earthworks. Drew does not remember meeting anyone else on the day; that is not surprising as only two of the 17 starters walked from Marlborough to Streatley. Walkers were given the option of walking in either direction between Streatley hostel and Marlborough hostel (Plough Cottage on the A4 about 1.5 miles from the centre of Marlborough). The route chosen followed much of what was adopted for the Ridgeway National Trail in the early 1970s but, in 1962 and 1963, the route included the stretch of track and road now called the Old Ridgeway. The Old Ridgeway may have been the original ancient route between Burderop Down and Liddington Cross Roads. In addition, the Ridgeway Walk left the Ridgeway about three miles north of the A4 at Overton Hill to cut south east across the downs and past Manton House to reach the A4 near Plough Cottage. The length of the route in 1962 was about 38.5 miles; hence the coyly worded reference to “approximately 40 miles” on the 1962 certificate. However, an article about the event, which appeared subsequently in the Reading Mercury, gave the distance as 45 miles. It was acknowledged that October was an ill chosen time of year. Moving the walk to the better time of May in 1963, together with more efficient organisation resulted in 24 entries in spite of little publicity. Confusion still reigned over the length of the route in 1963. Billed as a 45 mile walk, the organisers admitted in the report that “it was found afterwards to be just short of 40 miles”. The report confirmed that the route would be altered in 1964 “to ensure the distance involved is actually 40 miles.” For 1963, successful entrants had been issued with certificates referring to ‘45 miles’ and the group referred to these as ‘temporary certificates’. It is not known if revised certificates were issued showing the correct distance. In the early years, entries were limited to YHA members and it was necessary to stay at one or other of the two hostels on the Friday before and the Saturday night after the walk. Reading Group had created the walk to stimulate interest in Streatley and Marlborough hostels and the countryside surrounding them and group was reluctant to open the walk to the ‘general public’ as they felt this “would destroy its friendly easygoing atmosphere and emphasize the competitive qualities of the walk”. However, by 1968, the custom of allowing the entry of YHA members who had not stayed at Streatley hostel had become established. 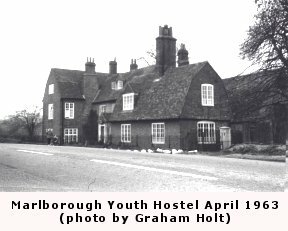 Perhaps the closure of Marlborough hostel in 1966 had led to a relaxation of the rules. By 1973, entries were “restricted to members of the YHA, the Long Distance Walkers Association (LDWA), the Ramblers’ Association, universities and technical colleges and the Ridgeway Group”. Officially, the Ridgeway Group was an association of people who had or would be entering or assisting the Ridgeway Walk: in reality, it seems to have been a useful tag for Norman Griffin to label any helper. In recent years, there has been no stipulation at all that entrants should be members of any organisation. Any fears Reading Group had that entries from the ‘general public’ would destroy its friendly, easygoing atmosphere appear to have been unfounded. The walk today is still friendly and informal. However, the competition element has certainly come to the fore, though the seeds of this may well have been sown when entries were limited to YHA members only. In each of the early years virtually the entire field finished in over 10 hours. But, as the years went by, walking times became faster and the proportion of walkers finishing under this time, some well under, grew. In 1967, Roger Clarke walking for Morley College, finished in 8 hours 35 minutes, a time so short that the warden thought he was a hosteller turning up on spec for a bed and was greeted with something on the lines of “You can’t come here now: we are expecting competitors from a Ridgeway Walk”. Times shorter than 8 hours 35 minutes became more common as the years went by. But, another development which would cut times even further than Roger Clarke’s had already been heralded in 1965: Alan Blatchford (described in the report for that year as ‘our Tanners Marathon man’) ran the route. Starting from Marlborough hostel nearly one and a half hours after the rest of the field, he passed them all, to a chorus of cheers and jeers after 15 miles, finishing at Streatley in 6 hours 22 minutes. As if this wasn’t enough, he retraced his steps almost 10 miles to meet his wife, Barbara, who was proceeding at ‘a more normal rate’ and he ended up covering almost 60 miles on foot in about 12 hours. The 1969 report stated that, although Reading Group made “every effort to deter people from treating the walk as a race, fast times were still being achieved” and went on to cite the case of Roger Tyler that year who finished in 8 hours 25 minutes and then drove back to Northampton for his night duty of pounding the beat! 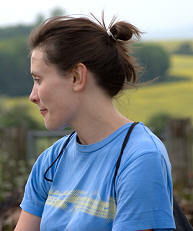 Inevitably, as the years went by and the Ridgeway Walk became a fixture in the personal calendars of many individuals and groups, walkers tried to do faster times than they had achieved in preceding years, or tried to get in before other members of their teams, as well as some trying to be first back. Another competitive element was that between groups to get the highest number of crossings (a term first used in 1985 meaning successful completions of the walk). In the 1970s, rivalry was particularly keen between the leader of the team table, the Vanguards Rambling Club and Croydon YHA Group. In some years, the entries from these teams were large: e.g. 20 Vanguards in 1974 and 25 Croydon YHA members in 1977. A few representatives of teams from the 1960s and 1970s still enter the walk though the competitive element is now somewhat muted. 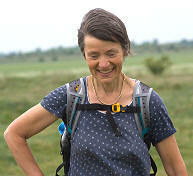 The original organisers believed that to finish the Ridgeway Walk itself is a great accomplishment without having to race against the clock. This was the reason why there was no overall time limit. Many finishing times were quite late in the early years of the walk and there are many tales of the organisers, wardens and marshals not getting to bed until the small hours of the Sunday morning. In 1968, however, a rule was introduced to retire walkers who arrived at Gore Hill (33 miles) after 9.00pm. As a consequence, that year there was a larger number of retirements, 38, than usual. Today, walkers are retired if they reach Gore Hill after 8.00pm. As times generally are faster now than 30 or 40 years ago, few walkers are affected by this rule. One worry of organisers over the years has been the dangers of walking in the dark. The particular danger of getting lost in the last few miles to Streatley are very great as there are numerous tracks over Compton and Roden Downs. Official sign posting in the early days of the walk was poor and Reading Group spent a weekend before the walk putting up waymarks along the route. This practice ceased in the 1970s and, as most of the route follows what is now the Ridgeway National Trail, the waymarking is excellent. However, waymarking was reintroduced at Whitefield Hill in 1999 as, in 1998, a lady runner who was the third person through the first two checkpoints turned right instead of left at the top of the hill and followed the National Trail all the way back to Barbury Castle. 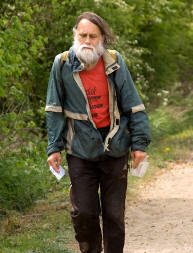 Apart from 1964 when Ian Davis took over the organisation of the walk, Norman Griffin organised it each year to 1979. In the early 1970s, Reading YHA Group ceased to operate and Norman organised the event on his own, though he received support on the day from the Ridgeway Group, many of whose members were former members of the group. In 1979, family commitments prevented Norman from organising the walk but a scratch event was held with the assistance of Graham Butler of the Vanguards. As Norman was finding it hard to maintain the standard of organisation which Ridgeway Walkers had come to enjoy, new arrangements from 1980 onwards were initiated. Norman would provide only a record and certificate service: hostellers would have to clear up after breakfast before catching the coaches to Overton Hill; non hostellers were asked not to use hostel facilities. As Norman said, “in effect, each walker would be organising his own event and any marshal service met on route was to be treated as a pleasant surprise and not a right”. The new arrangements (particularly those at Streatley hostel) prompted a few walkers to stay at the start of the walk, either at B & Bs or at the Ridgeway Cafe. The walk continued through the efforts of many marshals and walkers such as Roger Cambray of Blewbury Ramblers who organised the coaches. The 1981 walk was the last one with which Norman was involved. From 1982, organisation of the walk was taken over by the re-formed Reading YHA Group (now known as Reading Outdoor Group) with David Dare as the next organiser. With the renewed enthusiasm for organising the walk, the numbers of entrants rose sharply, after a faltering start when the London Marathon was inadvertently organised on the same day as the 1982 Ridgeway Walk. However, the 1984 walk was overshadowed by the tragic death of Les Hathaway, a runner with 12 Ridgeway crossings to his credit, who collapsed on the route and died from a heart attack. For 1985 onwards, St John Ambulance was asked to attend the walk, along with Raynet who provided radio communication between checkpoints and Streatley hostel. In 1986, the organisation passed to Charlie Pritchard, the secretary of Reading Group, and that year saw the largest number (197) of starters ever. The walk underwent further changes; for instance, the number of checkpoints was reduced from about a dozen to eight because of a shortage of volunteers. In 1990, a potentially serious problem put a question mark over the whole future of the walk when the Streatley Hostel appeared on a list of high value hostels which the YHA wished to sell to raise funds to improve other hostels in the network. Closure of the hostel was averted but closure of the Ridgeway Cafe could not be avoided. Charlie Pritchard retired after the 1996 walk. As no one came forward to replace him it was decided that no walk could take place in 1997. But most Ridgeway Walkers didn’t know this until they received the 1996 report in February 1997. Many Ridgeway Walkers wanted to walk that year but as time was short the likelihood of a walk being organised for the traditional date in May seemed doubtful. But it did take place through the combined efforts of several people. Ron Cutler of Reading YHA & Outdoor Group commissioned the help of most of the marshals and St John Ambulance; Mike Sandford of Abingdon Amblers organised the runners to set off at 10.30am. so that they’d arrive at checkpoints about the same time as the walkers; Ken Fancett, an LDWA member, produced the entry form and walk details; and Alan Smith (who was to take over as the organiser of the Ridgeway Walk from 1998) contacted as many past walkers as he could, and dealt with the bookings and the coach service. Unbeknown to Alan Smith, there had been criticism of the Ridgeway Walk in the letter pages of ‘Strider’ (magazine of the LDWA) in August 1996. 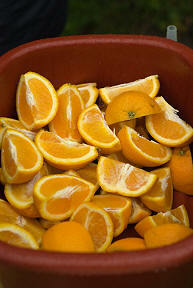 One of the complaints was that, apart from biscuits at Gore Hill, no food was available on the walk. Provision of food had been good up to the 1970s but had since declined. The new organisers wished to improve the situation and the small beginnings made in 1997 have been built on since to such an extent that Ken Royce of West London Ramblers said of the Ridgeway in 2000 that it had become part of the gastronomic calendar! From 1997, there came two new events. Mike Sandford began a separate 40 mile running race over the same route as the Ridgeway and using the same checkpoints and Ron Cutler organised a 20 mile walk from White Horse Hill to Streatley. In 1999, the Ridgeway Walk was diverted through Draycot to avoid part of Gypsy Lane (between Burderop Down and Whitefield Hill) which had become a quagmire. Wiltshire County Council did some remedial work which made the lane passable in 2000. They have since returned and repaired and improved the lane to a standard which is higher than it has, perhaps ever been. In 1999, filming also took place on the walk by a company making documentaries in the ‘routes’ series of television programmes for the Discovery channel. In the spring of 2001, paths in the whole country were closed to stop the spread of foot and mouth disease which had been detected at an abattoir in February and, eventually, affected large parts of the country. The Ridgeway Walk, in common with most cross country events had to be cancelled. The 2, 5, 10 and 15 crossings badges are awarded to walkers who have successfully completed the Ridgeway Walk (we've called these crossings for the past 20 years or so) for the number of times shown on the badge. 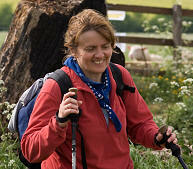 The crossings need not be done consecutively so, for example, a walker who successfully completed the Ridgeway Walk for the first time ten years ago and comes back this year and successfully completes another crossing will be entitled to the 2 crossings badge. Awards for 2, 5 and 10 crossings were first awarded in 1977. The badges were green for 2 crossings and red and black for 5and 10 crossings respectively. The badges were tin pin badges but they just said 'Ridgeway Walk 40 miles' on them. In 2006 the red cloth badge was introduced to replace the tin badge for 5 crossings. The 10 crossings cloth badge was introduced in 2007 and the 2 crossings badge was introduced in 2008. The colour of the 2 crossings badge was changed from green to blue as green is currently being used for the general badge. When the cloth badges were introduced, we tried to ensure that everyone who was around at the time received them in respect of their crossings record, even though many of them would have received the old tin badge. We may have missed some people out so if anyone entitled to a badge who hasn't got one, they should contact the organiser. A wide search amongst Ridgeway walkers, Ramblers and LDWA groups resulted in Phil Heneghan (a Wilts LDWA Group member) offering to take over the organisation of the walk. His LDWA group have declined to take over the walk as they already have a challenge walk of their own (the Pewsey Downsaround). 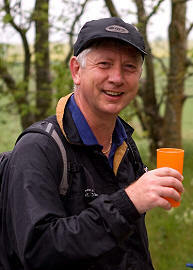 So Phil and a few like-minded friends have formed a separate organisation called the Ridgeway 40 Walk Association. Phil and his friends can do with all the help they can get. Many marshals have said that, all things being equal, they will be prepared to help out on future Ridgeways. 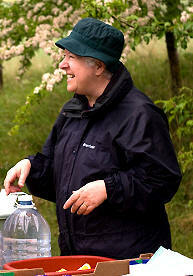 But, Phil would appreciate a few more volunteers to marshal and to take part in the organisation itself. In particular, a volunteer to oversee hostel bookings and liaise with Streatley hostel would be very useful. Please contact Phil at phil.heneghan@virgin.net. The association will organise the walk on the same lines as hitherto and the next walk will be on Saturday, 11 May 2013. Those walkers who have expressed no objection to their details being passed to the new organiser(s) may hear from the association with details of the 2013 walk. This event now comes under the auspices of the newly formed The Ridgeway 40 Association. This is the updated history of the Ridgeway Walk as it appears in the 2012 report which was a special issue to mark the 40th anniversary. It contains much more than this web article as there are statistics for the whole 40 year period, articles on various subjects connected with the walk, articles by Ridgeway Walkers, anecdotes, cartoons and many illustrations. It is 29 pages (size A4) with 7 pages covering the report of the 2012 event and is considered essential reading for anyone interested in the walk or, indeed, anyone interested in the development of modern day long distance walking. Copies of the report can be obtained for £3.50 (including postage and packing) from the organiser.
! Date for your Diary !